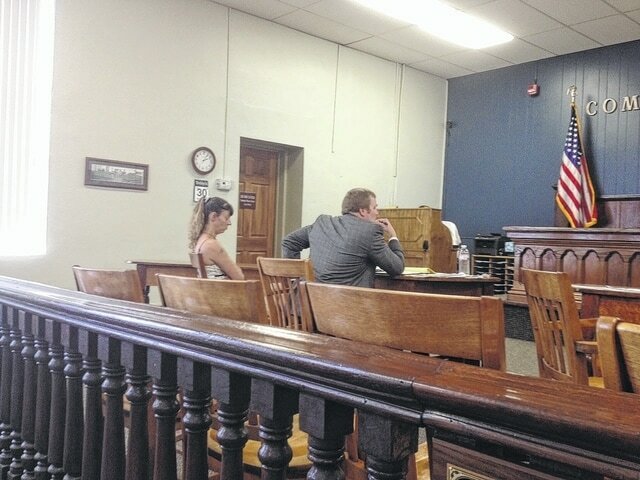 Evans-Goode with her lawyer during Tuesday’s trial. POMEROY — A Letart Falls woman has been found guilty of operating a methamphetamine lab. The trial in Meigs County court began Tuesday for Susan Evans-Goode, accused of operating a methamphetamine lab in Letart Falls. Her arrest on Jan. 21 came after officers from the Meigs County Sheriff Department went to the residence after noticing suspicious activity on influx logs, which contain information provided by individuals wishing to purchase products containing pseudoephedrine. This data can be used by law enforcement to differentiate between a person purchasing for self-use of the allowable 9 grams every 30 days and someone trying to obtain the substance more frequently. Information included in the influx logs include driver’s license, signature and date of purchase. Evans-Goode was indicted on two separate counts: knowingly manufacturing a controlled substance — specifically, methamphetamine — and possession of substances necessary to be used in the manufacture of methamphetamine. Prosecutor Colleen Williams called Stanton Wheasler, a forensic scientist from the Ohio Bureau of Criminal Identification and Investigation (BCI), to the stand. According to Wheasler, several of the items tested positive for meth and included plastic bottles containing 1.12 grams of meth and a plastic bag containing bottles with glass vials inside them holding a total of 41.49 grams. Trace amounts were also found on rubber tubing and residue was discovered on items in a plastic bag, he testified. When asked by Williams how accurate the testing had been, Wheasler said that BCI labs were accredited by several agencies and standard BCI protocols were used in testing. Sgt. Robert A. Smith, of the Meigs County Sheriff’s Office, testified that on Jan 21, 2015, while investigating a possible meth lab in the Racine area, he had been watching influx logs for unusual pseudoephedrine purchases in the area. The logs suggested suspicious activity that led him to a home on Bucktown Road. According to Smith, when he knocked on the door, Mark Russell, the defendant’s boyfriend, answered the door. Smith advised him of what they were there for and ask permission to look around the property. He testified that Terry Carmichael and Susan Evans-Goode were sitting on the floor with equipment normally used for smoking meth. He said he also saw Drano and tubing under the kitchen sink. Having probable cause, he escorted Russell and the two females out of the house. “She became loud and belligerent, screaming they (sheriff’s officers) didn’t have the right to be there,” he said. After obtaining warrants, Smith said he searched inside the house while Detective Rick Smith from the Middleport Police Department searched outside the premises. Smith said they found ammonia nitrate, water bladders, foil with reside, empty pseudophedrine blister packs, a coffee grinder, rock salt, batteries, Coleman fuel, scales and empty ice packets — all items commonly used to operate a meth lab. Williams asked Smith to identity pictures taken at the house the night of the search. Among the items was a date book taken from Evan-Goode purse. The book contained dates, names and amounts of money, and was identified by Smith as Evans-Goode’s by personal information found inside the purse. Carmichael was later called to the stand and questioned by Assistant Prosecuting Attorney Jeremy Fisher. Carmichael pleaded guilty earlier this year and is awaiting sentencing on charges similar to Evan-Goode. In a plea deal in exchange for testimony, Carmichael expects to be sentenced to one year in prison, six months in rehab and five years on probation. Fisher asked Carmichael to identify the defendant, which she did. She was then asked by Fisher to recount the events of Jan. 21. “When police arrived at my house, Susan and I were smoking meth amphetamine, Terry was not,” she said. Carmichael said Evan-Goode had been living at the residence for about a month before the arrest and that she had personal items at the house, including items in a room Carmichael identified as “Susan’s” bedroom. “Susan, Mark and myself went to Walmart in Gallipolis to get Sudafed,” Carmichael said. She stated she couldn’t remember who made the purchase that day, but prior to that day, she had purchased Sudafed at least eight times. She said each time she gave it to Evan-Goode in exchange for money. Their next stop was a hardware store to purchase Coleman fuel, Carmichael said. “When we returned home, Susan gave me meth,” she said. Carmichael went on to recount police arriving shortly after they returned home. When questioned further about her activities, she said the previous day the three had made purchases for other ingredients needed to make meth, and she had watched “Susan and Mark make meth the night of the 20th at the house.” After they were finished, they put the trash into the trunk of Susan’s car. When defense attorney Thomas Saunders, of Gallipolis, cross-examined Carmichael, she said that she did not make the meth, but that she has watched others make it. “I plead guilty to having the chemicals at the house, but not to the production of the meth,” she said. The prosecution rested. The defense also rested without calling any witnesses. In less than 30 minutes after closing arguments, the jury returned with a guilty verdict on both counts: illegal manufacturing of meth and illegal assembly of chemicals with the intent to manufacture methamphetamine. Evans-Goode was remanded to the custody of the Meigs County Sheriff until her sentencing at 1:15 p.m. Wednesday.